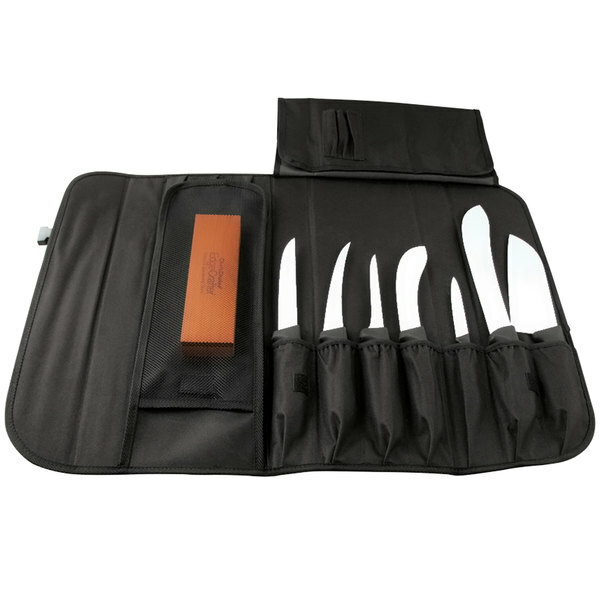 10 Pocket Knife Case - 20 1/2" x 6 1/4"
Use this 10 pocket knife case to organize and transport your most essential culinary tools! 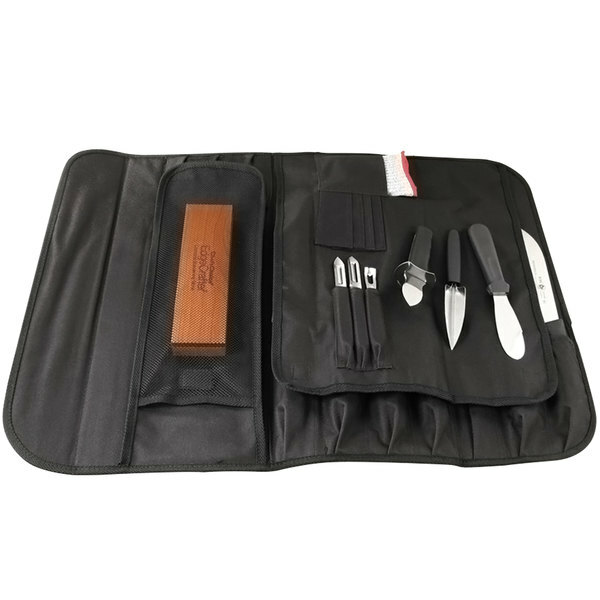 Made of rugged, cut-resistant, black nylon, this knife case comes with ten pouches of varying size that permits you to protect your whole collection of knives and accessories. 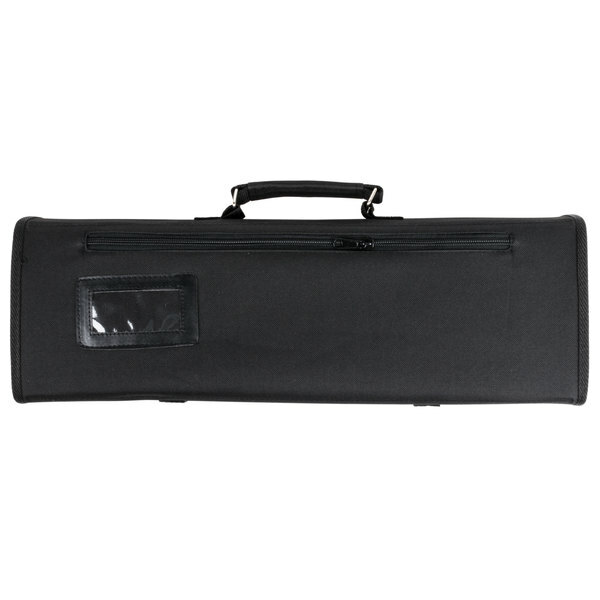 It also comes with a carrying handle and 2 clips for closure, which make transporting this lightweight unit a breeze. The knife case also features inside compartments for pens, an outside zipper pocket, and a business card holder. 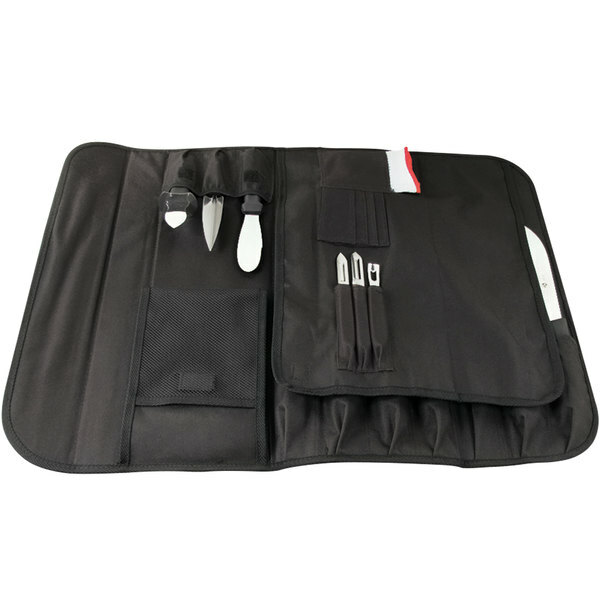 With this knife case, your professional look will match culinary expertise! 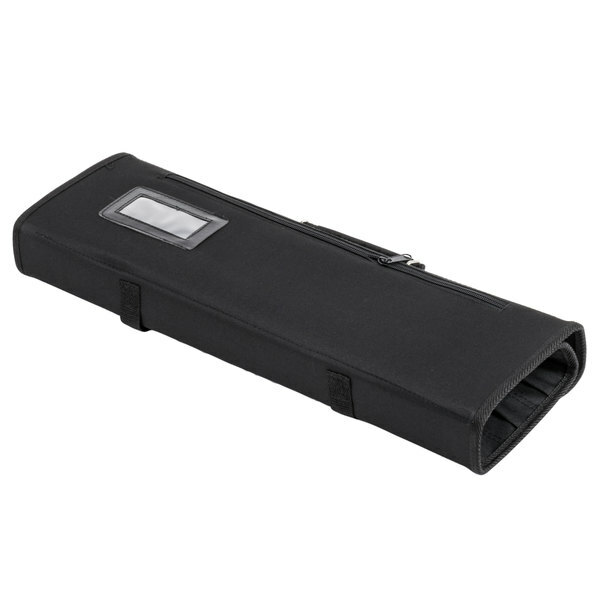 Overall User Rating: 10 Pocket Knife Case - 20 1/2" x 6 1/4"
Great bag for all my knives and sharpener, Its look professional and high quality, now I can carry my knives with me without any hesitation. Great Product! I needed a new knife bag pretty quick for a last minute catering job, and this one arrived just in time. Well made and a good value for sure. I really like this knife case because of the stiff sides that when closed creates a clean, professional looking kit. Lots of pockets for a variety of tools. This case is a nice option to travel on location with so you don't have to take all of your knives if not necessary. This case is extremely durable and there is plenty of storage for all of your essentials. Everything from your knives, pens, thermometers, tongs, spatulas, etc. Just a wonderful case. This case is perfect for me! I am able to take my knives, knife steel, fish turner, thermometer, and other essentials with me wherever I go without worrying about them being dulled or damaging other things. Bought this for my husbands knives, and wile they all fit, its just not quite as nice as my other knife roll. The inserts are a nice touch and make the bag ridged, offering plenty of protection for the knives inside. Do your fingers a favor and order blade guards for your knives; it can be easy to knick yourself on the adjacent blade when removing your knife. This is a really good knife roll! 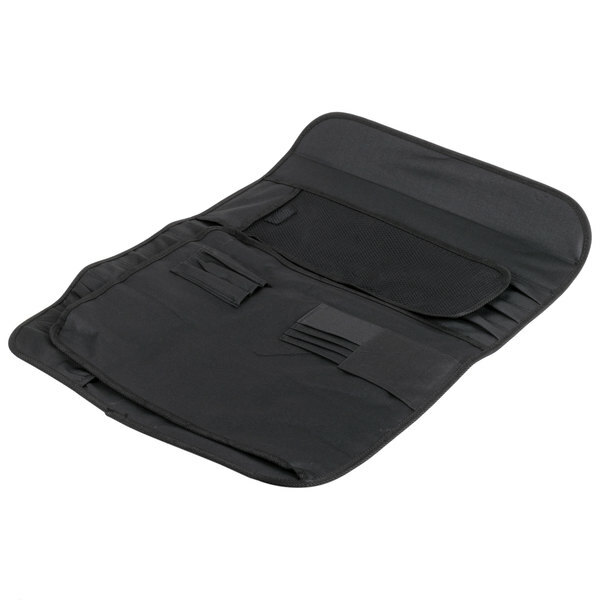 It is very durable and it is easy to keep your things organized. I like the spare flip pouch. 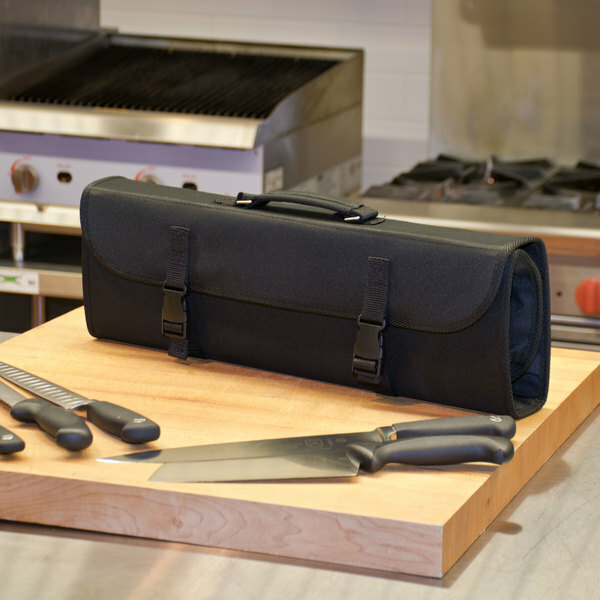 What an awesome knife roll kit! Very strong exterior that rolls up nice and tight to keep all your knives and tools very secure and safe! 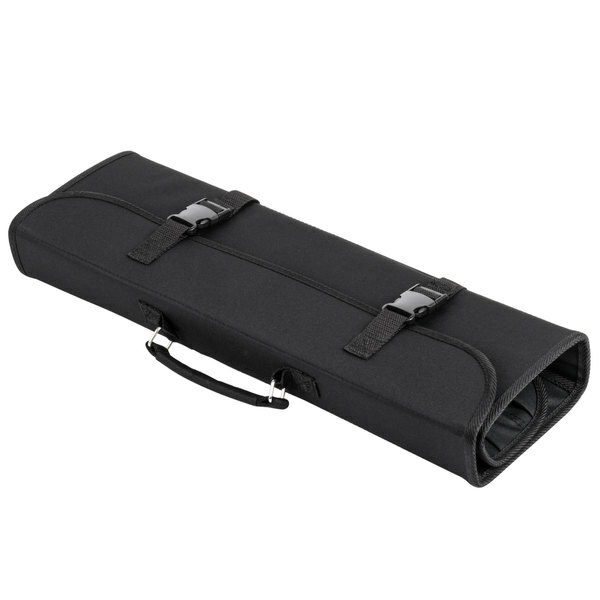 This knife roll is very durable. It has a hard outside but still rolls up very tightly so that your knives dont move around inside. There are plenty of pockets for everything from knives to your peeler. My only complaint is that the mesh pocket is looser than I would expect and it doesn't come with a shoulder strap. 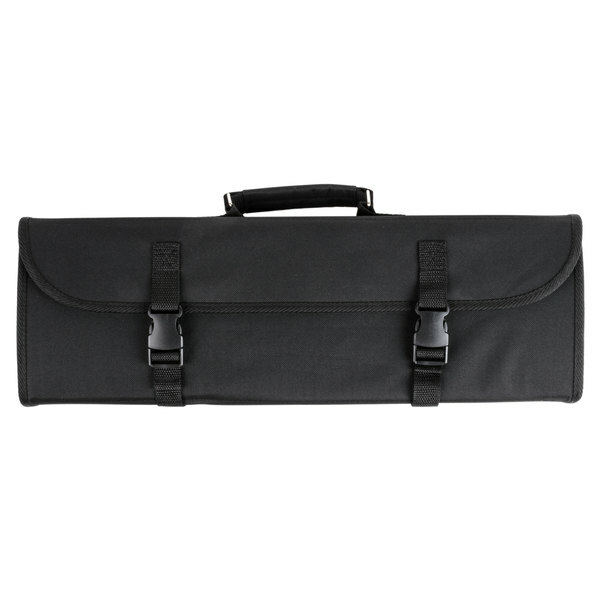 This is an outstanding knife roll, great quality, and great price. I use this one on catering events when i need a nice spread of tools. Grab one now before the price goes up. 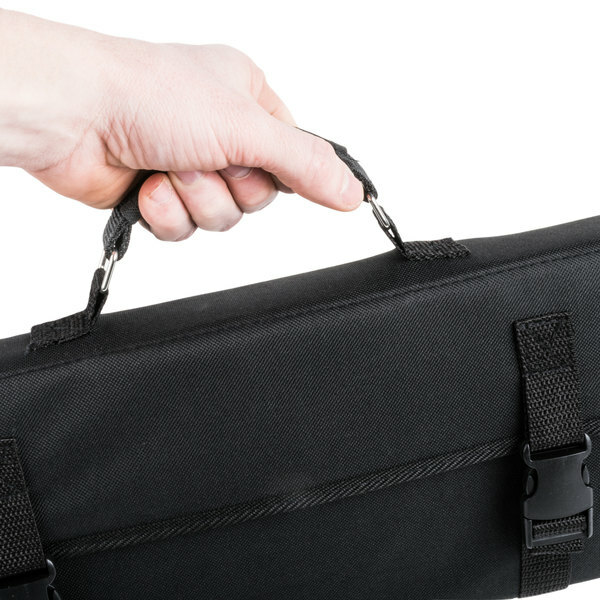 This is a very nice knife roll, especially for the money. The rigid material is very sturdy and the knives are safe and secure. Totally worth the price to be able to take my knives and go!